A document prepared by a FIFA committee says the South is willing to move some 2022 matches north of the DMZ. 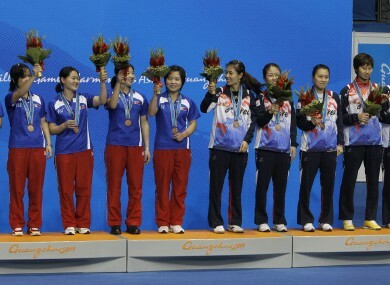 North Korean (left) and South Korean table tennis players celebrate after both teams won bronze medals in women's table tennis at the Asian Games. South Korea has reportedly said it would allow the North to hold some games in 2022. A REPORT PREPARED by a FIFA committee has indicated that South Korea would be willing to hold some matches in North Korea if it was to be awarded the 2022 FIFA World Cup. Bloomberg says it has received a copy of a summary of bidding documents produced by FIFA’s technical panel ahead of its official publication tomorrow, which appears to indicate that “the Korea Republic’s [South Korean] bid-hosting concept presents the idea of holding some matches of the 2022 FIFA World Cup in Korea DPR”, or North Korea. The document provides a summary of all the bids from the nations vying to host the 2018 and 2022 tournaments, prepared as a summary for the 24 members of FIFA’s Executive Committee who will announce on December 2 which nations will be awarded each of the two tournaments. A European country will win the 2018 tournament – with England and Russia considered the front-runners – while South Korea faces opposition from Australia, Japan, Qatar and the United States in an attempt to win the following tournament. FIFA president Sepp Blatter said last week he felt the potential awarding of the 2022 tournament to the Korean nation – which joint-hosted the 2002 tournament with Japan, the only previous occasion on which the World Cup has previously been held in Asia – would present it with a good chance to bridge the divide between the two Korean nations. Email “South Korea would give North some World Cup games”. Feedback on “South Korea would give North some World Cup games”.